Please login below or register an account with www.4c-squad.rs. Lock On: Flaming Cliffs 3 (FC3) is the next evolution of the Flaming Cliffs series. 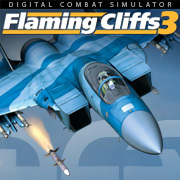 FC3 features the F-15C, A-10A, Su-27, Su-33, MiG-29A, MiG-29S and Su-25. FC3 aircraft provide an easy learning curve for new players and focuses on a broad range of aircraft rather than a detailed single aircraft. FC3 adds a number of new features and improvements to previous versions of the Flaming Cliffs series. FC3 is a module of DCS World, which makes it compatible with all other DCS: World titles like A-10C, Black Shark 2, P-51D, and Combined Arms. DCS: Ka-50 Black Shark is a PC game of the Russian Ka-50 attack helicopter and is the first title in a new Eagle Dynamics and The Fighter Collection simulation series: Digital Combat Simulator (DCS). Following Eagle Dynamics tradition of excellence, DCS: Ka-50 Black Shark will bring an even more realistic simulation experience than its predecessor LockOn: Flaming Cliffs.